While browsing Pulse London earlier this month, I came across an accessory label RASSIN & SHEN. As someone who wears glasses while out and about, I’ve been struggling with the practicality of storing my glasses when I don’t need them. Also, I used to love how my grandmother stylishly wore her glasses chain, which, like a piece of jewellery, added sophistication to her outfit and the overall look. As you can imagine when I spotted what Rassin & Shen do, I was like a kid finding a treasure. They offer beautiful and functional accessories for eyewear, opening a new category between fashion accessories and eyewear. It was co-founded by Efrat Rassin & Tara Shen in 2015 after winning Sirius Programme Award for great ideas, funded by UK Trade & Investment. Their debut collection focuses on eyewear jewellery; necklaces and chains to hold glasses and sunglasses. 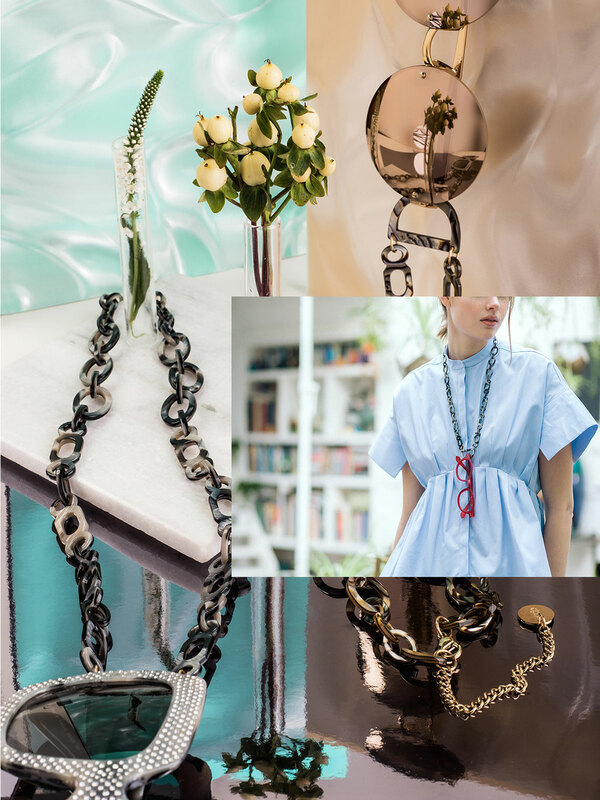 The necklaces are handmade of highest classacetate cellulose, sourced from the most discerning suppliers, carefully tailoring each colour and style to reflect the latest trends in eyewear. The designs have playfulness and hidden function as well as reference to ideas such as women’s strength and appreciation of artisanal quality. The raw material is sourced from France, from one of the best cellulose acetate, which is aplant-based plastic, commonly used in the eyewear industry for premium and luxury frames. The material is known for its many high qualities; strong, lightweight, flexible, hypoallergenic and a wide range for transparency, rich colours. Each item is handcrafted in a traditional 30 years-old family business in Poland. The brass findings are ethically sourced and plated with 18ct gold with impeccable attention. To ensure the supreme quality of their products, everything is carefully examined in London before they go to customers. This article is from our Estila EDIT 21. Get inspired with more amazing stories in this issue. Don’t forget for limited time only, we’re offering the Matthew Williamson issue for FREE. Get your copy here.